Delighting Australia with Cadbury's Biggest Product Launch Ever | Careers | Mondelēz International, Inc. In May, our Australian team delighted customers and consumers with two world-first varieties – Cadbury Dairy Milk with Oreo in Mint and Strawberry. The blocks range has enjoyed a run-away success across several Mondelēz International markets, so it seemed the perfect innovation for Australia and New Zealand by combining two of our most loved brands and product attributes into a re-imagined chocolate treat. Richard Weisinger – Senior Brand Manager Chocolate Innovation said the Australian team wanted to leave their own mark on the launch and maximize the opportunity to make Cadbury Dairy Milk with Oreo even bigger Down Under! “Our innovation team is always on the look-out for globally proven platforms and trade secrets to bring new offerings into our region and bring joy to our consumers in unique ways. “We worked closely with our Research, Design and Quality (RDQ) and Consumer Science colleagues, as well as our consumers to arrive at our three block flavors – Vanilla, Mint and Strawberry – which our global team would now like to include as a flavor line extension in other markets. “It’s a great testimony to the innovative thinking that can come from all corners of our business,” Richard said. 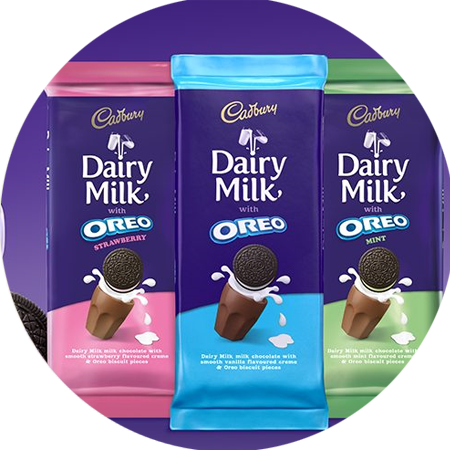 With more than six million blocks hitting shelves across the nation, the launch of Cadbury Dairy Milk with Oreo has been the team’s biggest yet, and was made possible by outstanding supply chain execution from innovation and RDQ; to manufacturing and logistics; to marketing and sales. Paul Chatfield - Associate Director Marketing Chocolate said with such a large launch planned, his team knew they needed to approach the Cadbury Dairy Milk with Oreo promotion differently from a creative and media point of view. 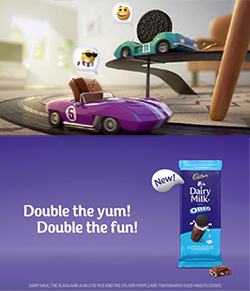 “We decided to tell a story of how two of the world’s greatest snacking brands, Cadbury Dairy Milk and Oreo, became friends – becoming double the yum and double the fun! To bring the story to life, we created an animated film using emojis which was amplified through digital and out-of-home media channels to raise rapid mass awareness. “We know that over eight million Australian rely on emojis to communicate with friends, which is why we used the colorful symbols to bring our Cadbury Pip and Oreo Cookie feature film characters to life. Pip and Cookie’s emojis’ expressed more about their personalities than words could ever achieve, which strengthened our messaging in media channels void of sound. See more... Click below to open our Youtube video! Do you want to lead our next launch? Search for our current vacancies by clicking below.